We can use the theory of supply and demand to further understand the benefits of international trade. Consider two countries, Brazil and the United States, who produce sugar. Each country has a domestic supply and demand for sugar, as detailed in Table 1 and illustrated in Figure 2. In Brazil, without trade, the equilibrium price of sugar is 12 cents per pound and the equilibrium output is 30 tons. When there is no trade in the United States, the equilibrium price of sugar is 24 cents per pound and the equilibrium quantity is 80 tons. These equilibrium points are labeled with the point E. Notice that in this set-up, Brazil is the low-cost provider of sugar and has the cost-advantage. Figure 1. Free trade results in gains from trade. Total surplus increases in both countries. However, there are clear income distribution effects. The extra 15 tons of sugar production, shown by the horizontal gap between the demand curve and the supply curve in Brazil, is exported to the United States. In the United States, at a price of 16 cents, the farmers produce a quantity of 72 tons and consumers demand a quantity of 87 tons. The excess demand of 15 tons by American consumers, shown by the horizontal gap between demand and domestic supply at the price of 16 cents, is supplied by imported sugar. Free trade typically results in income distribution effects, but the key is to recognize the overall gains from trade, as shown in Figure 1. 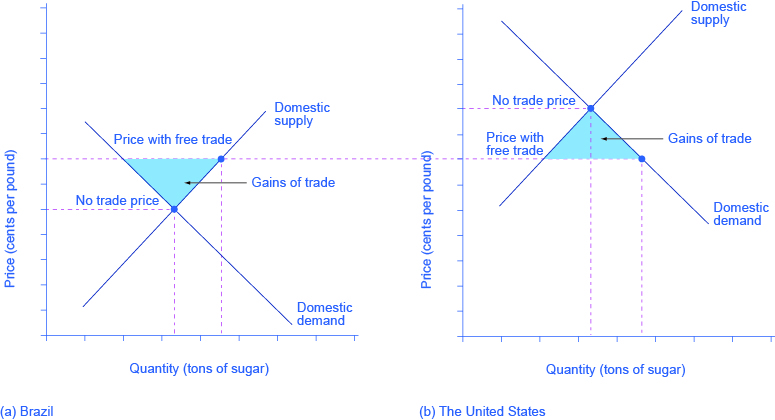 Building on the concepts you have already learned about supply and demand and consumer and producer surplus, Figure 1(a) shows that producers in Brazil gain by selling more sugar at a higher price, while Figure 1(b) shows consumers in the United States benefit from the lower price and greater availability of sugar. Consumers in Brazil are worse off (compare their no- trade consumer surplus with the free-trade consumer surplus) and U.S. producers of sugar are worse off. There are gains from trade—an increase in social surplus in each country. That is, both the United States and Brazil are better off than they would be without trade. Figure 2. 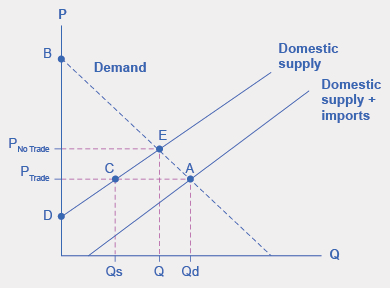 When there is free trade, the equilibrium is at point A. When there is no trade, the equilibrium is at point E.